Becoming a noted chef in Melbourne can be a tuff gig, there's incredibly fierce competition and if you don't bring your A-game you'll be putting up a closed sign on your door before you can say 'fussy Melburnian's'. But there's one guy, by the name of Andrew McConnell, who has seemingly relished the challenge and has propelled himself to the forefront of Melbourne's dining scene in a matter of years. McConnell has not only opened some of Melbourne's most popular restaurants, including Cumulus Inc, Cumulus Up and Cutler & Co, but has also done much to define food trends and cuisine in this very culinary conscience city. Luckily for me, I had the opportunity to dine at his St Kilda venue Golden Fields a few nights ago and was able to see what all the hype about McConnell was all about. Located on the so-hip-it-hurts Fitzroy Street in St Kilda, Golden Fields gives off a wonderfully laid-back modern vibe without feeling like it's trying too hard. The space, created by Melbourne architects Project of Imagination, is clever and considered with an open kitchen and long marble bar that gives the whole space a, airy and honest vibe without a hint of pretension. The Asian-inspired menu offers a broad selection of sharing dishes that draws on McConnell's years spent working in Shanghai and Hong Kong, where he was exposed to traditional street food as well as modern interpretations. The extremely helpful wait staff explained the well thought out menu, which is divided into 'Raw', 'Starters', 'Salads and Veggies', 'Meat and Fish' and 'Dessert', which makes ordering less of a minefield. It means you can avoid choosing the braised lamb shoulder that is quite frankly, huge, for an entrée...because we all know that's not going to be pretty for anyone. The only problem that I encountered with the menu was that, most unfortunately, I wanted to eat everything on it...I know, first world problems. But how could I not be tempted with dishes like tuna, white miso and eggplant, fried chicken with sticky soy and ginger or the pan roasted John Dory with mussels. Still I made my decisions and I was more than happy with all of them. 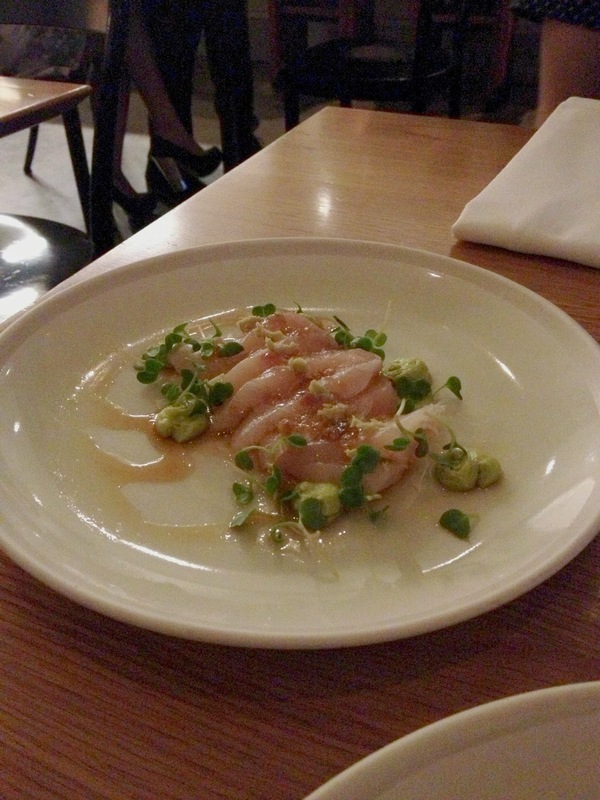 To start we had the wonderfully light kingfish sashimi with avocado, fresh wasabi and konbu. It was fresh with clean flavours and the wasabi was a delicious addition that was more for flavour than blow your face off spice. Thank-god. We also couldn't go past one of Golden Field's signature dishes; the mud crab roll. 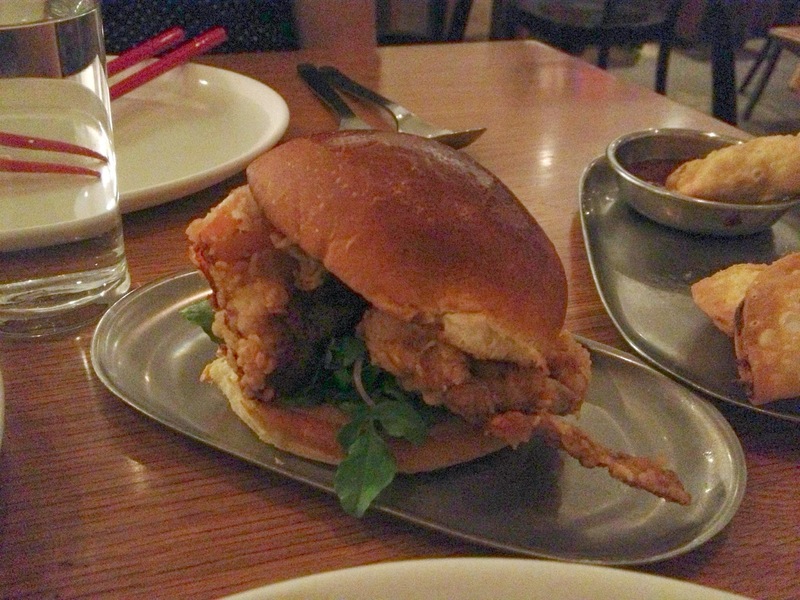 Fried soft shell crab sandwiched between two soft brioche buns with a healthy dose of kewpie mayo for good measure. The crab was crunchy on the outside, soft on the inside and wonderfully sweet, with the mayonnaise adding necessary punchy flavour. I can now understand why this dish sent shock-waves through Melbourne's epicurious stratosphere about a year ago (seriously, I'm pretty sure I read about 43 articles on this one little burger), because it is very good. To finish our starters we chose from the wednesday night dumpling menu (a great little additional menu) and had the fried shiitake and cabbage dumpling with sweet chilli sauce. Of course these were delicious, they're dumplings! 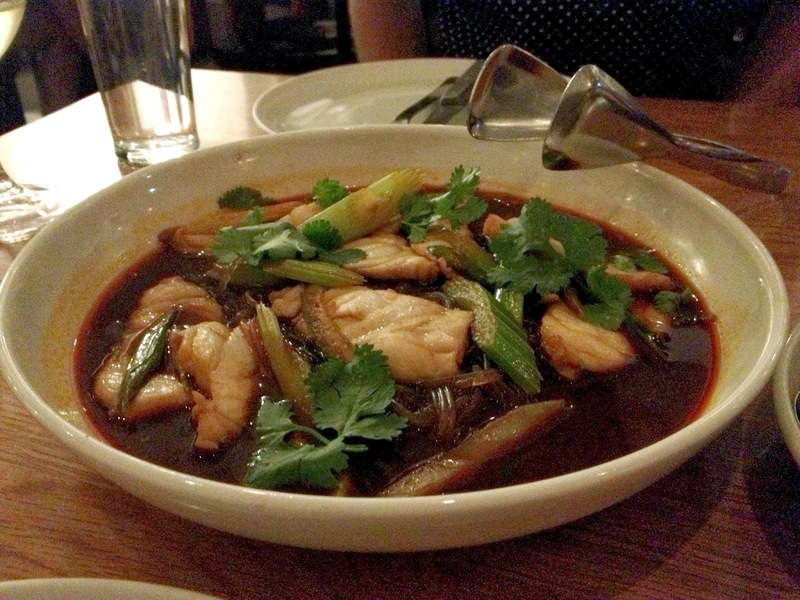 For the main course we braved the heat with spicy fish, sichuan chilli broth and glass noodles. It was indeed spicy, but not enough to make my taste buds go numb, I was still able to enjoy the perfectly cooked and delicately flavoured fish, the freshness of the spring onions and the smooth glass noodles slicked in broth. Over all a winner of a dish. 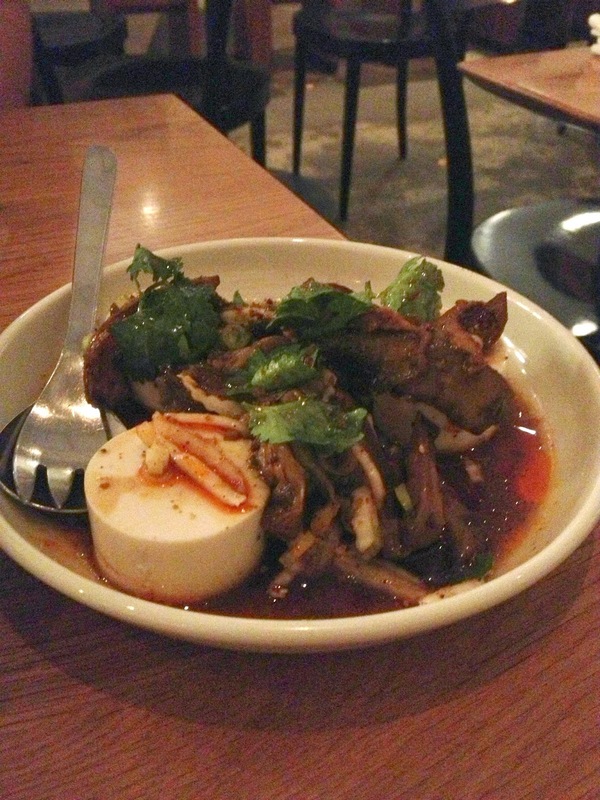 To accompany the fish we opted for the refreshing sounding marinated eggplant, silken tofu, coriander and chilli vinegar. I like to think of eggplant like a flavour sponge and this was no exception. It soaked up the beautiful marinade, leaving it wonderfully soft and intense in flavour. The tofu was soft and decadent and was a welcomely refreshing after a few mouthfuls of our sichuan fish. For dessert we could hardly pass up another signature dish; the peanut butter parfait with soft chocolate mousse and salted caramel. Oh yes, it is as amazing as it sounds. To sum it up in one word, all I can say is deliciousness. I'm not a huge dessert person, but if there were one dessert to float my mostly savoury-dominated boat, it would be this one. The parfait was beautifully peanutty, the chocolate mousse was creamy and rich and the salted caramel wasn't overly sweet or cloying. Scattered peanuts over the top added a necessary textural crunch to keep things interesting. All up, the dish was balanced, texturally perfect and not too heavy. Now for the bad news. At the end of March Golden Fields will be moving to Flinders Lane and turned into Supernormal, a new venture by McConnell. 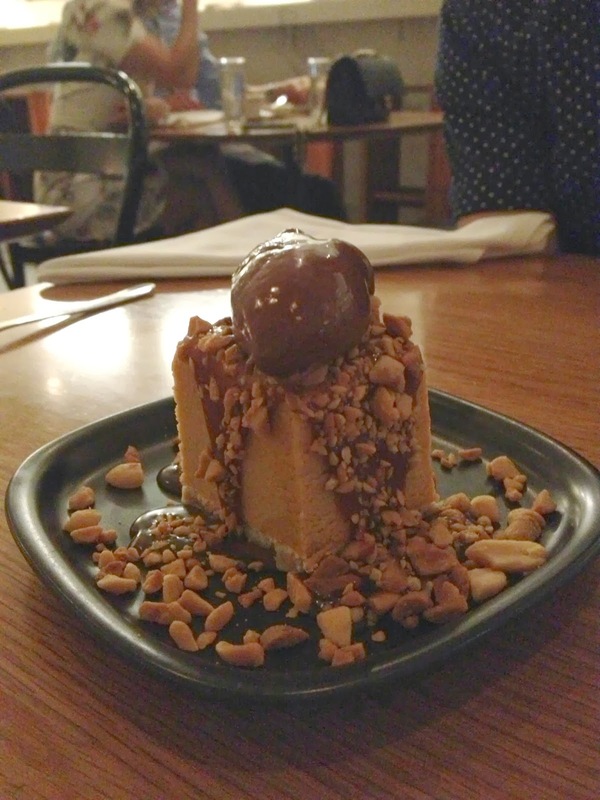 But before you begin to have nightmares about missing out on the peanut butter parfait (I would if I hadn't tried it either), take heart, because Supernormal will follow a very similar structure and menu to much loved Golden Fields. It promises to be just as laid back and with the Asian-inspired sharing menu still in full swing. McConnell also intends to fill the Fitzroy Street space with another restaurant, meaning that the loss of Golden Fields will actually bring the eager public a gain. So now all we have to do is wait and see what McConnell comes up with...seriously, does this guy ever sleep?